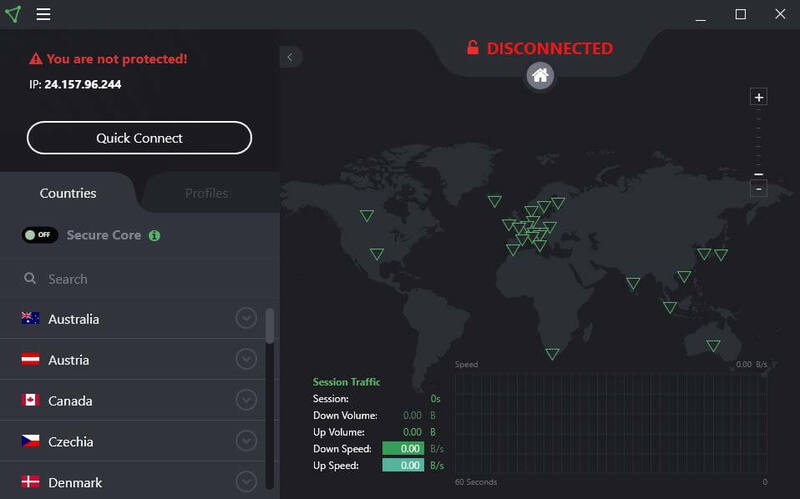 ProtonVPN review 2019: Is it good enough to justify the high price? This is a fast and reliable VPN service that is suitable for streaming and torrenting, although it’s on the pricier side and customer support could be better. The name Proton might ring a bell, and if you’ve ever used ProtonMail, you’d be right in thinking there’s a connection here. The provider of the popular email platform have also been running this VPN service for several years. promise to deliver a variety of features including super-strong security and fast speeds. This service doesn’t exactly come cheap, so there’s no doubt that many potential users will be wondering if it’s worth the money. We’ve been trying out ProtonVPN on your behalf to see what it really has to offer. 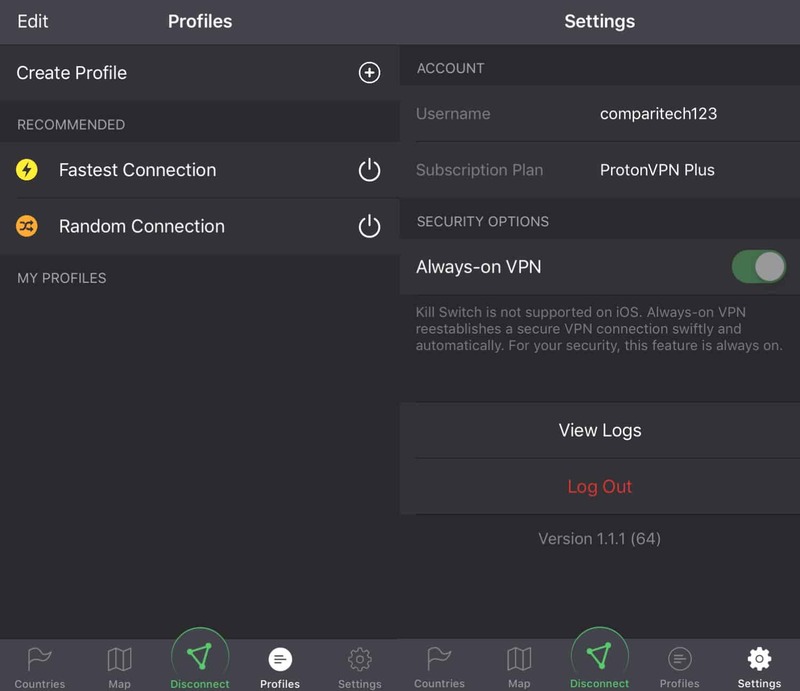 ProtonVPN has native apps for Windows, MacOS, and Android, and has recently added one for iOS. Linux and some routers can be manually configured to work with the VPN. Additional features, which we’ll explain in more detail below, include Plus servers, Secure Core, and the option to use Tor over VPN. 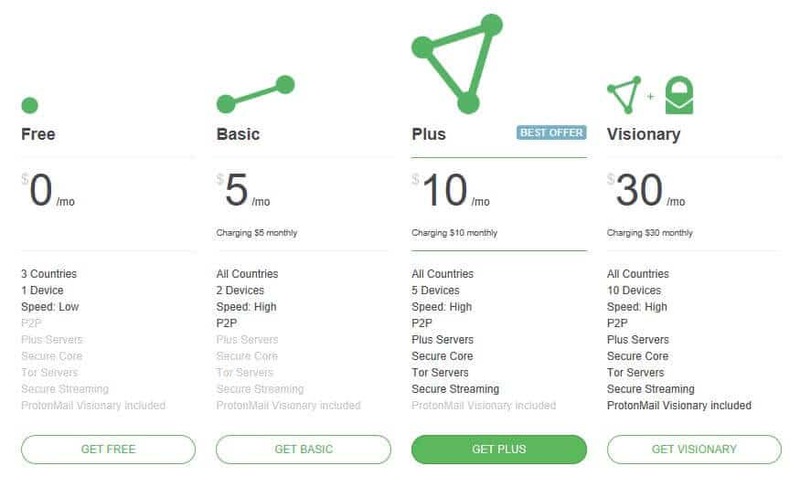 ProtonVPN has four pricing tiers: Free, Basic, Plus, and Visionary. The pricing page itself is a bit confusing as you have to use a toggle in the upper right-hand corner to switch between monthly and annual pricing. Clearly, the company isn’t looking to sell users on the free option which offers just three locations (Japan, Netherlands, and the US), one device, and slow speeds. 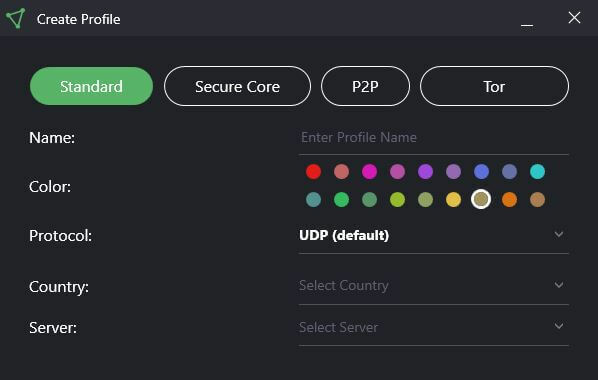 The next tier is Basic, which gives you access to all servers, allows you to connect two devices simultaneously, offers fast speeds, and allows P2P. This plan costs $5 per month or $48 per year for an annual plan. The latter gives you savings of $12 and works out at $4 per month. This price is similar to that of many top-rated providers’ far superior plans, so you can already see that this is an expensive service. The Plus plan is the one that is most comparable to the premium plans we usually test in reviews, and indeed is the one we’ve been trying on for size. This will set you back $10 per month on a monthly basis or $8 per month if you pay for a full year up front. 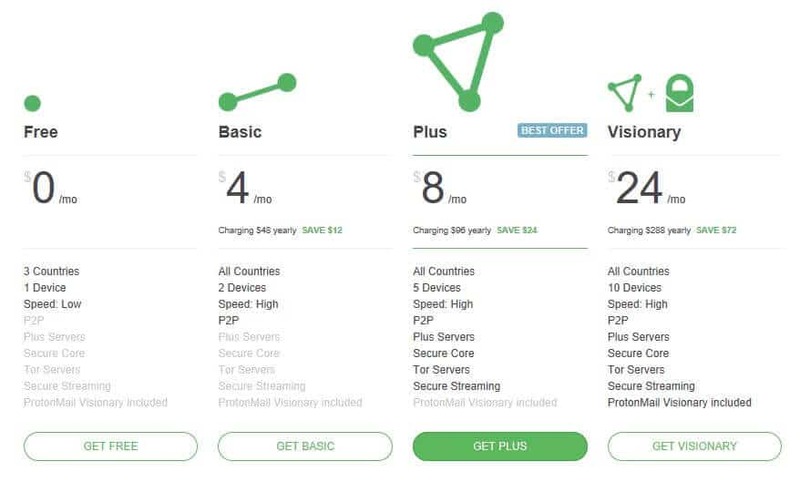 With the Plus package, in addition to the Basic plan offerings, you have the ability to connect up to five devices simultaneously, access to streaming, Tor, “Plus” servers, and “Secure Core” options. There is one more tier above this, dubbed Visionary. On top of the Plus features, you can connect an additional five devices at one time — so 10 in total — and have a ProtonMail Visionary account included. This is a lot more expensive at $30 per month on a month-to-month basis and $24 per month on an annual term. Note that a ProtonMail Visionary account is the same price and includes the VPN. Payment can be submitted using a major card or via PayPal. In keeping with ProtonVPN’s dedication to security, privacy, and anonymity, there is also an option to pay via bitcoin which will be good news for more privacy-conscious users. READER DEAL: Sign up for the annual plus deal and save $24. All plans come with a generous 30-day money-back guarantee, so you can always take the service for a test run and get your payment refunded if unsatisfied. ProtonVPN offers just over 380 servers in 32 countries. We have seen smaller VPNs do very well, such as PrivateVPN which has under 100 servers, although that provider admittedly does cover more countries. But then you have much larger VPNs that offer huge networks of thousands of servers (NordVPN has 5,000) spanning many more countries (ExpressVPN covers 94). 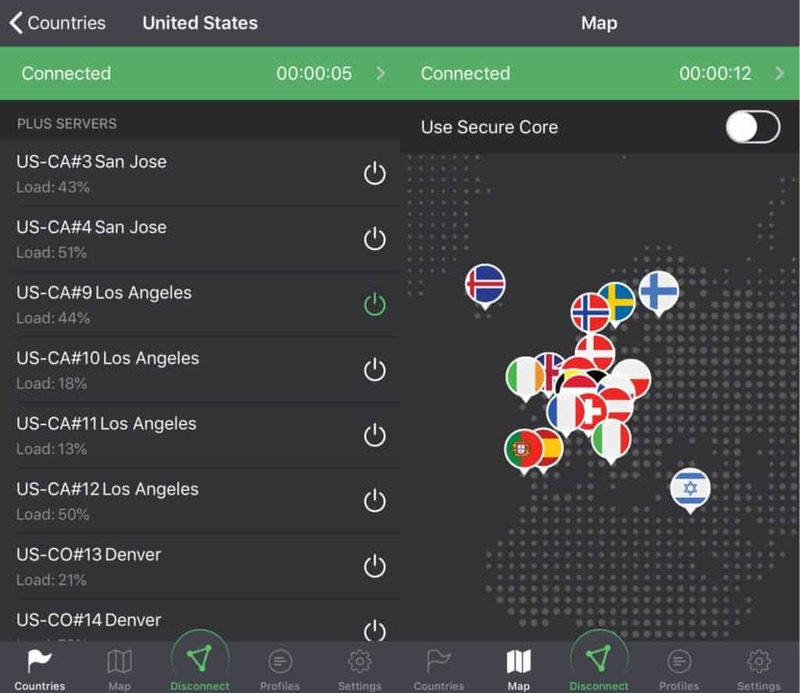 Most ProtonVPN servers seem to be concentrated in Europe and North America, with some in Asia and a few in Australia and South Africa. When choosing a server, you can simply choose by country, or you can use the dropdown for each country to choose exactly which server you want. One special feature that ProtonVPN offers is Secure Core. When this is switched on, your traffic will be routed through two servers instead of one. Secure Core servers are located in Switzerland, Iceland, and Sweden, and can only be used in conjunction with certain other servers. For example, you can opt to connect to a Canadian server via one in Switzerland. The Secure Core feature can be toggled on and off in the server list within the app. Bear in mind this could slow things down, so should only be used where privacy is a major concern. We tested servers in various locations in the US East, US West, and the UK by performing several everyday online tasks, such as general browsing, streaming HD video, and playing online games. We had no lag or buffering issues and saw no noticeable slowdowns when connected to the various servers. What’s more, disconnecting and connecting to servers was quick and painless. We also tested each of the above servers for speed. When we run these tests, we aim to be as empirical as possible by downloading the same test file (100MB in size) at three different times during the day. The tests are run in Toronto and the file is downloaded from a server in Oregon. At each timepoint, we also run a control test with no VPN connection. You can see the results in the boxplot below — the line where the dark and light blue boxes meet shows the median speed. Lower is better. The size of the box is an indicator of the spread in the results. Smaller means more consistent. As you can see, ProtonVPN fared very well during these tests. For the US servers, it pegged speeds just 0-30% slower than the control, which in the world of VPNs is excellent. For the UK servers, we often see significant slowdowns, but with ProtonVPN, speeds were just a few seconds slower than the US servers. What’s more, the small box size shows that results were very consistent, so you won’t have to wonder whether the service will be fast or slow with different servers at various times of the day. We should note that these results can only serve as an approximate indicator of what you might actually experience when using the service. The volatility of the internet adds a factor of randomness, so the tests should be taken with a grain of salt. They were run while using a 60Mbps connection, so you may see longer wait times with a slower connection, and potentially smaller or larger discrepancies. Does ProtonVPN unblock Netflix and other popular streaming sites? Yes, ProtonVPN does work with Netflix. Many VPN providers will mark specific servers for use with streaming services, but ProtonVPN doesn’t, so it’s not immediately obvious which servers to use. If you try a random server, chances are you won’t have much luck. At the time of testing, there were just over 20 servers on the list and we tried a random few of them. All the ones we tested worked to unblock Netflix with no issues. Note that there are only US servers on the list, so you probably won’t have much luck unblocking Netflix libraries from other countries. We tested a few random servers in the UK, France, and Japan, but couldn’t access the respective local versions of Netflix. To test the mobile issue, we tried one of the listed Netflix servers on iOS, and it did actually work to unblock Netflix. So what about other streaming services? We tried Amazon Prime Video but weren’t able to unblock it, even with the successful Netflix servers. ProtonVPN did claim to be able to unblock Amazon Prime Video and Hulu on all servers, although this information changed on the website while conducting this review. Now it only claims to unblock Netflix and Hulu. Finally, we tried to access some popular UK streaming services with a UK server with mixed results. We were unable to unblock the notoriously strict BBC iPlayer, but ITV Hub and All 4 worked with no issues. Does ProtonVPN work in China? Yes, ProtonVPN should work in China, but only on certain servers. We asked customer support for an up-to-date server list, and they were able to provide us with a selection of more than a dozen servers, including several in the US. That being said, users posting on ProtonVPN subreddits have voiced concerns about being unable to connect in China as recently as mid-2018. As such, if this is your primary use for a VPN, you may want to look to a more reliable provider. The area of security and privacy is definitely ProtonVPN’s forte and is a subject of focus in its marketing materials. This provider is based Switzerland, a country with some of the world’s strongest privacy laws. ProtonVPN’s creator, Proton Technologies AG, can also hang its hat on its reputation as a secure email provider, having offered the popular ProtonMail since 2014. Aside from solid privacy. ProtonVPN offers a strong suite of security features, including 256-bit AES encryption, which is considered as good as it gets. This is in conjunction with perfect forward secrecy, a SHA256 hash, and 2048-bit RSA keys. When it comes to protocols, you have just one option: OpenVPN. This is the one we recommend to users so it’s not a bad thing, but it’s nice to have choices available. For example, IKEv2 is a faster alternative for some mobile devices, which can be great for surfing or streaming on-the-go. Strong encryption is crucial, but it needs to be backed by leak protection, so that you be assured all of your information will stay safely inside the encrypted tunnel. ProtonVPN gives you DNS and WebRTC leak protection and has a kill switch built into all apps (except iOS). The latter will kill the internet if the VPN connection happens to be lost. ProtonVPN uses its own private DNS servers, which is a plus for the privacy-conscious. This means that Google (or another third-party DNS provider) can’t snoop on traffic requests. We mentioned the Secure Core (essentially double VPN) servers earlier, but it’s worth noting the great lengths that ProtonVPN goes to in order to protect these servers. The Swiss ones are located in a former Swiss army fallout shelter, 1,000m underground; the Iceland ones reside in a secure former military base; and the Sweden Secure Core servers are in an underground datacenter. It’s clear that security is top of mind for this provider. For the most part, getting started with ProtonVPN is straightforward. For this review, we’ve been testing out the Windows app and the manual OpenVPN configuration for iOS. Once you’re logged in to the Windows desktop client, you’ll arrive at the home screen. ProtonVPN has taken the approach of a wide app interface versus the mobile-esque design many providers use. While it doesn’t look as neat, it means that you have a lot of information in one place. Here you can see the server list along with a server map, as well as session info, such as your current visible IP address and session duration. Note that to connect to a server, you have to choose from the dropdown list, as the map appears to be there only for display purposes. You can select a country from the alphabetical server list or select the arrow to the right of the country to see an expanded list of all servers for that location. Here, you can see which city they’re located in, which helps if geographic distance or the ability to unblock local content is a concern. For each server, the load is shown by a partially-filled green circle and the percentage value next to the server name. Torrenting servers are denoted by an icon displaying two opposite arrows. It’s a bit confusing because many providers denote torrenting servers with “P2P.” In the ProtonVPN server list, a “P” symbolizes Premium servers, which means that the server is only available in the Plus or Visionary packages. Tor servers are marked with an onion symbol. To access the settings, click the menu icon in the upper left-hand corner of the screen and select Settings. Here, you can adjust startup options, switch your default protocol, and turn the kill switch and DNS leak protection on and off. Note that the kill switch is off by default while DNS leak protection is on. Back in the main screen menu dropdown, the other option of note is Profiles. This feature enables you to create custom “connection profiles” that can then be easily accessed from the main screen. When you create the profile, you can start by choosing the type of server you want, along with the protocol you’d like to use, a server country, and a specific server. You can name and assign a color to each profile for ease of recognition. Once your profile is created, it will appear in the Profiles tab in the main screen (behind the Countries tab). This feature is handy if you tend to use different settings for various scenarios. For example, you might select a faster protocol and a US server for streaming US Netflix. This app is fairly intuitive for beginners and probably has just enough options and features to satisfy advanced users. Until recently, iOS users had to connect through the OpenVPN Connect app, with setup taking us around 20 minutes when we last tested it. However, there is now a native iOS app available through the App Store which has you up and running in no time. You can simply enter your credentials, choose a server, and allow the app to make changes, and you’re good to go. You can select a server from a dropdown list or a map and create a profile which allows you to save specific servers. Servers are marked with their current load to help you with your selection. The Secure Core feature discussed earlier is available within the app and can be included when you create a profile. 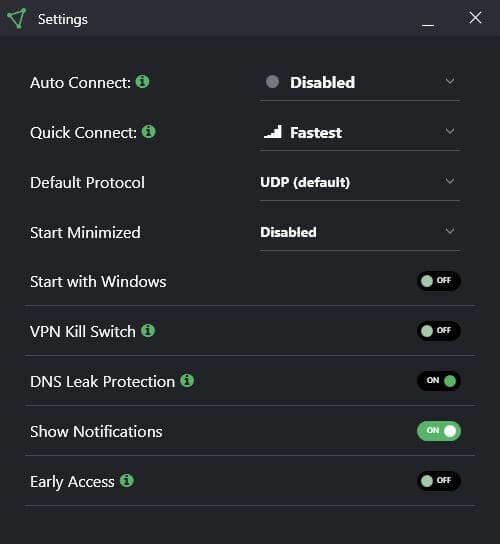 The lone setting in the Settings screen is Always-on VPN which will reestablish a VPN connection as quickly and automatically, should it drop for some reason. This doesn’t replace the functionality of a kill switch, but it can be helpful. The new app is fairly plain but it works and is a much better option than manual configuration. For help with setup, troubleshooting, and more, ProtonVPN provides some general guides, tutorials, and FAQs in its website support page. There isn’t a ton there, but it’s probably sufficient to help you with most common issues. If you can’t find what you’re looking for, unfortunately, there’s no live chat feature, so you’ll have to use the contact form. When we tried this, a popup told us we could expect an answer in 1-2 days, which isn’t ideal if you have a pressing issue. We ended up getting a response within about 14 hours. Not too bad, but it could be quicker, especially given there’s no live chat feature. What’s more, the email response came with a note that stated it was outsourced to Zendesk, so you don’t even enjoy the additional privacy you would get from in-house support. As for downsides, customer support is a little slow, which will be a turnoff for beginners who might need help getting started. Lastly, the service isn’t cheap, so you might want to look for a better deal elsewhere.